In this remarkable volume, a multinational team of scientists catalogs the stressors and benefits for combat-trained soldiers deployed on missions where they are told to hold their fire and assume the role of peacekeeper. Theory and direct research with peacekeepers is incorporated. Missions covered include, but are not limited to, peacekeeping operations in Haiti, Somalia, Bosnia, Kosovo, Iraq, and Lebanon. The terminology of peacekeeping and military operations is listed. 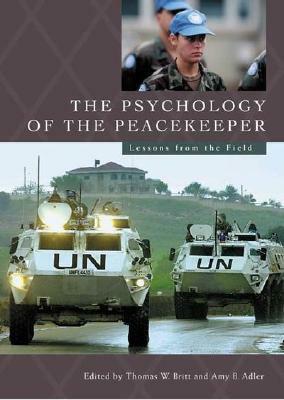 The stressors, threats, dangers, frustrations, and benefits of the peacekeeper role are described in dramatic detail, with additional attention to the Peacekeeper Stress Syndrome. With the goal of increasing peacekeeper health and well-being, which in turn increases the likelihood of establishing a stable peace, this volume also addresses interventions and preventative measures. The extent of psychological distress and disorders following peacekeeping operations is documented. Interventions are recommended for various phases of deployment, in order to minimize the likelihood of post-deployment psychological problems. Experts in social, industrial/organizational, health, clinical, and cross-cultural psychology contribute to a multi-dimensional perspective. Each chapter author reports psychological research with military personnel in peacekeeping operations. THOMAS W. BRITT is Associate Professor of Psychology at Clemson University.AMY B. ADLER is a Senior Research Psychologist and Science Coordinator with the U.S. Army Medical Research Unit-Europe, Walter Reed Army Institute of Research in Heidelberg, Germany.